WATERLOO, ON – The latest Canadian brewery to jump on the lime beer bandwagon is Brick Brewing, who have just launched Red Baron Lime, a brand extension to their flagship Red Baron Lager. 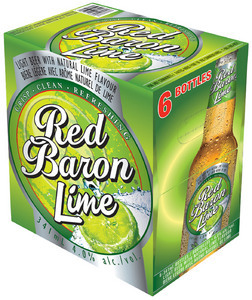 Brewed to 4% abv with natural lime flavouring, Red Baron Lime will be available at all Beer Store outlets in Ontario, and will be supported by a multi-platform advertising campaign, including the new website lustforlime.com. New Brunswick’s Moosehead Breweries have announced that Moose Light Lime will be available in Ontario in time for the Labour Day weekend. Alberta’s Big Rock Brewery have made Big Rock Lime a permanent addition to their portfolio after originally launching it as a summer seasonal. Anyone notice how ALL of these new beers are all tryin’ to copy CORONA ? -‘dats right. I just wish Corona was priced like Red Baron Lime. This is a great light fresh tasting beer.